Conventional 2HB Pencil – Environmentally-Unfriendly! Manufacturing a conventional 2HB pencil is absolutely not eco-friendly. It is one of the key factors responsible for heavy deforestation and environmental damage. Trees are grown, cut down, and then wood is harvested for creating standard pencils. The wood is processed and graphite is inserted inside the hollow casing and the end-result is an ordinary non-environmentally friendly pencil. Imagine what the state of our eco-system is with more than 10 billion standard pencils produced and discarded every year. Along with harvesting wood, industry-based method is used to create conventional pencils, thus leading to pollution, environmental harm, and damage. More and more scientific studies conclude conventional wood pencils are doing more harm than good to the environment. It is our responsibility to think and act in an eco-friendly way at least in some manner. The best way is to use eco-friendly writing materials and office supplies. There are many companies offering environmentally friendly writing accessories and pencils. 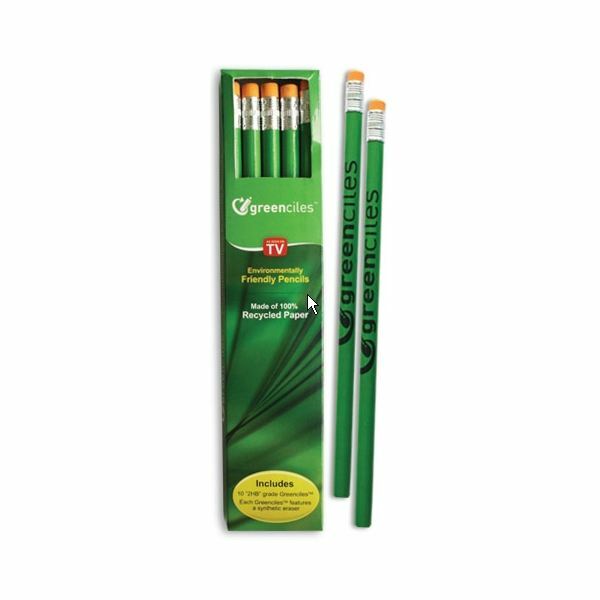 Greenciles® is one such company that offers eco-friendly pencils. The pencils are manufactured completely out of recycled paper of all types, such as printer paper, waste stationaries, and newspaper. There are no raw materials involved in the manufacturing process. Environmentally-safe papers are acquired from land-fills to manufacture these eco-friendly pencils. Treesmart is another great manufacturing firm that produces environmentally-friendly pencils. The pencil casing is created entirely from rolled up newspapers. The method adopted by Treesmart in manufacturing eco-friendly pencils is quite innovative. There are no toxic recycling chemicals involved in the manufacturing process. Each sheet of newspaper is cut to a specific size. A special adhesive solution is mixed with each sheet of newsprint to form a cohesive trunk as hard as wood. No.2 graphite is hand-rolled to create each pencil. The pencils are oven-dried for more than 24 hours. After the drying process, the pencils are shaped into a round barrel. Rubber erasers and US made quality ferrule are attached to the end of each pencil. The rubber erasers are latex-free and the ferrule is of high quality. Eco-friendly drawing pencils are also sold by mainstream pencil manufacturers, such as Faber-Castell and Derwent Cumberland. Faber Castell has its own reforestation project in Brazil, from which wood is used to manufacture environmentally friendly pencils. The project enables the company to grow its own trees on deforested land in Brazil. The denuded land was a result of soil erosion. Faber Castell also recycles wood to manufacture eco-friendly drawing pencils. The pencils are packed in an attractive case and are of very high quality. Derwent Cumberland also uses waste timber and pencils to manufacture fine art pencils. And if you want a wood-free pencil, then you can surely try out any good quality metallic lead holders. These have a nice finish and don’t use any timber. These alternatives to conventional pencils are a great choice for your art work. Environmentally friendly pencils not only look great on our desks, but also ensure that we are behaving responsibly to save our environment. The next time you make a purchase, make sure you buy such pencils.